It’s funny how I can come home from Trader Joe’s with bags full of food and immediately begin debating what I should make for dinner. Sometimes, having too many options makes me feel as though I have none. 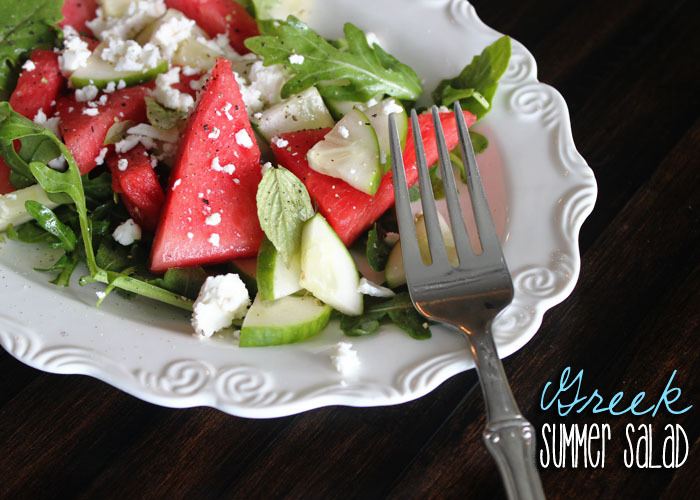 Then, somewhere near the intersection of what I’m in the mood for, what might go bad soon and what I just brought home, I come up with this Greek Summer Salad. 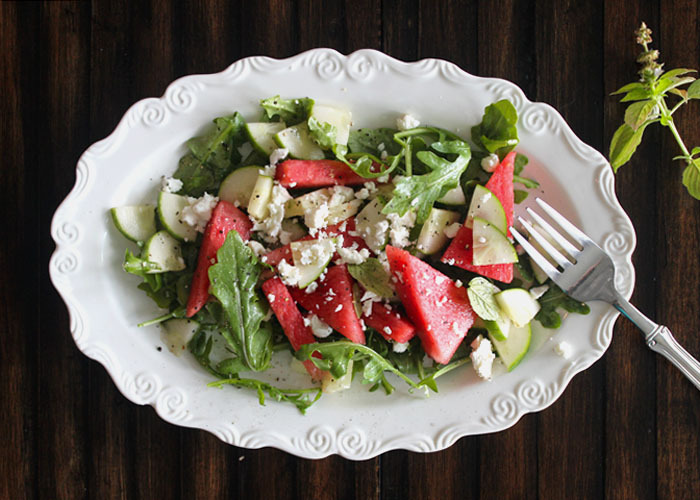 Based on how much I enjoyed this simple combination, I think this summer will be filled with many more fruit, herb and cheese salads. Any ideas for a salad with nectarines? Cut English cucumber into small pieces and place in large bowl. Add arugula and basil leaves. Set aside. Whisk together, olive oil, lemon juice, red wine vinegar and salt and pour over cucumber, arugula and basil mixture. Toss to coat. Spread mixture on a large platter. Remove rind from watermelon and cut into small pieces. Gently place over greens on platter. Gently crumble feta cheese over the top. If desired, top with freshly cracked black pepper. If you are looking for an idea for another salad to use up some nectarines or other similar orange citrus fruits, you could diversify your portfolio and tap into some Southern cooking with a summertime Ambrosia salad 🙂 My grandparents would say “its healthy!” and it was in the 1950s… where the rest of your picnic was fried chicken and potato salad! Its light and refreshing, though, and really easy to make. Maybe you could “Greekify” the recipes with some Greek yogurt and a little honey and/or mint? Put on your best 50s throwback dress when you make it! P.S. Sorry this comment is late to the game – miss you! This is a great idea Katie! I do love nectarines and could easily see it coming together with some yogurt, honey, seeds or nuts. I’ll keep you posted on this one! Hope all is well in Thailand!